What better way to welcome in spring than a lovely display of daffodils. 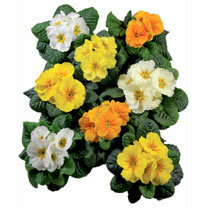 Now you can start the season even earlier with this unique mix of different complimenting daffodil coloured primroses with the extra large Rambo flowers and sweet scent on the warmer days through January and February. Height 11-20cm (4-8"); spread 11-20cm (4-8"). Supplied in 9cm pots. Ideal for beds and borders, patio pots and containers, hanging baskets. Attractive to bees and butterflies. Grows well in sun or shade.